Best produces great wine! Pretty presumptuous! But the truth is different: Best is the surname of the founder – John Best – of the vineyard and Great Western is a part of Central Victoria’s Grampians. 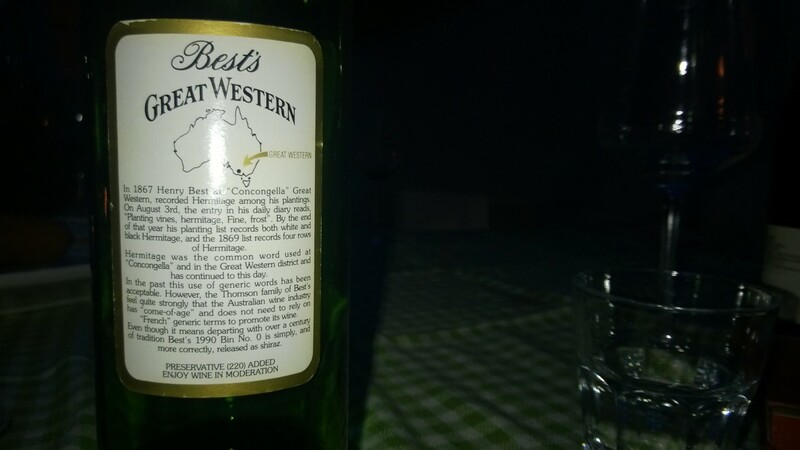 Best’s Great Western is one of the most famous Australian vineyards ca. 200 kilometers west of Melbourne. Perhaps this is a bit confusing, but certainly curious. This vinery is one of the oldest one of Australia. Since the webpage of Best’s vinery offers an enormous variety of information about their history, winemaking, description of vineyards as well of course all current wines, I will not write about them too much but like you to visit the their great webpage: http://www.bestswines.com. Since 1920 a formerly Scottish family called Thomson bought the vinery and its vineyards. The name Best remains to be on labels and it still the brand although – as far as I learnt – the Thompson belong to the most precious winemakers of Australia. I haven’t been there – yet – as Australia perhaps didn’t belong to those countries in which I was too much interested. Reading the story of this winemaker, the wonderful drinking experience in a great company with my friend Grant Hill let me change my mind. Of course Australia is more than desert, huge meat production, some unique rocks and Aborigines. Although it is common to pool Australian wine along with wines from USA, New Zealand or Southern America as wine from the New World we have to admit that there is wine production – at least in Great Western – since more than 200 (!) years, too. The soil is granite sand as a result of wash outs of surrounded rockets. Because wind can blow and heavy rains wash away parts of the soil the ground is covered with hay and other dry plants. In this area you experience four seasons – so winemaker faces sometimes the same challenges as their colleagues in Europa: baffle weather conditions. The quality of this wine is remarkable. It isn’t comparable with any of those rather fashionable Shirazes from Australia which are relatively sweet, voluminous, mostly heavy and strongly oaky. It would be a humoristic summery but this wine tastes like a light and not too sweet version of a Schwarzwälder Kirschtorte. The wine has tastes of wild and sour cherry together with some eucalyptus. It is a colder kind of wine; you imagine some wet and foggy countryside drinking the wine. It is astonishingly fresh and in particular light – almost contrary to what I had in mind thinking of Australia; barrique is really much reduced even though of course you will recognize that the wine spent its time in a barrel. The wine is very elegant and due to its serious age wonderful smooth and balanced. This is real winemaking, without any special effect or outstanding treatment. The Thomsons are not following the fashion respectively the expectations of the global market and they are right! The quality is impressive. Grant Hill, who introduced the wine to me, told me that they don’t produce this wine only if vintage is good enough. According to him the Thomson family’s wine production is considerable smaller comparing to many other producers but they at the most famous and prestigious ones. I am very glad that this wine has been introduced to me – along with a very interesting story. Grant Hill is executive producer of so many famous and great films as for instance Matrix, Cloud Atlas, Titanic (co-producer) and many more. You would think such an impressive filmmaker would have some rather cosmopolitan or – let me call it intellectual background – but he is the son of a farmer not far away from Great Western. This of course made the wine for me to something even more special. Wine does connect, wine does tell stories of so many different regions in our world and sometimes impressions and memories of wines are linked not with a special taste only but some very personal experiences or heritages. Although I know Grant collects much more wines but having such special, 25 years old and simply very delicious wine from his home country means something special! This 1990 (!) bottle was rich of aromas, some tannin; strong individual character the aftertaste confirms all its power!